RoadRunner Fuels and Convenience Store is located in Aztec, NM. Our large fuel tanks provide fuel for the local community, as well as our company vehicles. RoadRunner Fuels provides easy, large truck access with satellite fueling for trucking companies with tanker trucks, water trucks and septic trucks. 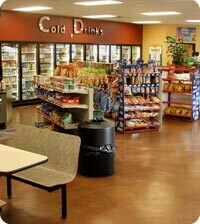 It includes a convenience store, truck stop, RV center, propane, ATM and a wide variety of hot foods and snacks. We take pride in our clean, neat and friendly atmosphere where our staff always greets you with a smile. We accept American Express, Discover, Master Card, Visa, ComData, Fleet One, Wright Express, Voyager, TCheck, EFS, and TCH. Roadrunner Fuels and Convenience Store is part of the Aztec Well family of companies. Your official Aztec Speedway ticket sales headquarters.